In Cuba under the Castro brothers having a difference of opinion with the government can be a matter of life and death. Jorge Luis García Pérez "Antúnez" led the list of over 800 members of the opposition warning against foreign investment that would serve to strengthen the totalitarian dictatorship on the island.The document was initially made public on June 6, 2014. Five days later at 6:00am there was no knock on the door of Antúnez's home but instead it was kicked down by state security. Sadly, it was not the first time that this has happened and as before the objective was political repression on the part of the dictatorship operating with impunity in Cuba. This afternoon Yris Tamara Pérez Aguilera, Jorge Luis's wife, made known over twitter that her husband has been on hunger strike since June 15th in protest of his unjust and arbitrary detention and the beatings and tortures suffered. She also denounced the continued harassment of state security agents. Tonight Antúnez's family is asking for your help in a simple and concrete way: signing a petition directed at the Castro regime demanding his immediate and unconditional release. The petition was published tonight by his sister, Bertha Antúnez who was exiled in Miami in February of 2008. In the video below she outlines, in Spanish what has taken place over the past week. Below is a brief summary. Beginning one week ago yesterday on Wednesday, June 11, 2014 at 6:00am state security agents raided the home of opposition activists Jorge Luis García Pérez "Antúnez" and his wife Yris Tamara Pérez Aguilera taking them prisoner and ransacking their home. We learned about the detention because Yris managed to send out between 8:49am and 8:56am five tweets announcing their arbitrary detention. Human rights defenders and pro-democracy activists inside and outside of Cuba mobilized quickly to denounce their arbitrary detention demanding their immediate release while news began to emerge of a wider, nationwide crackdown. "They told me that for three things we assaulted the house: First: Because you are inciting propaganda distribution, Placetas has become a real chalkboard. Second: Because you have become the spokesman here in Cuba in combination with the extreme right of the exile as a barrier to the normalization of relations between the United States and Cuba. [Third:] We know that you head here in Cuba this new tendency that is causing us problems, that the revolution may have a recovery and for your fault and many recalcitrants in and out of Cuba that has not been achieved. And fourth, we are alerting you that have orders of the Interior Minister to bust you up each time that a poster appears in Placetas and if you do not give up your position." "Now more than ever I stand by my slogan “I will not shut up, and I will not leave." I know that what the tyranny is worried about is that I won't go away, and will continue talking. Today I alert the world that my life is more in danger than ever." On Sunday evening, June 15, 2014, the married couple went for a walk to decompress and were again grabbed up by state security. The following day neighbors realized they were missing and activists, who had also been detained, reported hearing the voices of Antúnez and Yris in state security detention centers. "I went to the PNR (Revolutionary National Police) unit in the municipality of Placetas, from where I am speaking to learn about the arrest of this brother and sister and the state security official called "Reinier" tells me that these activists will be processed by justice without say anything more, or give me another reason. When I ask him again, he answered me and repeated that they would be prosecuted and did not know how long they would be there, because he did not know, he had nothing to do with it, he had to wait for orders from the high command, "said Paceiro Pérez. On Monday afternoon Damaris Moya Portieles along with six other activists took to the street to publicly call for the release of Jorge Luis and Yris they were quickly grabbed up and roughed up by state security and detained. Released later Damaris reported seeing Yris . 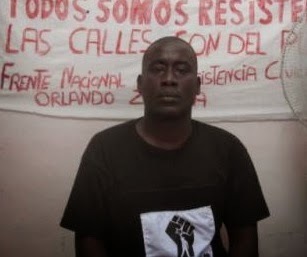 "The undersigned call on the Castro regime to immediately release Jorge Luís García Pérez “Antúnez”, Secretary General of the National Resistance Front Orlando Zapata Tamayo. We call on the Cuban exile, human rights organizations and all people of good will in the world to make common cause and support this effort. The world is mobilizing on his behalf a statement has been made public signed by NGOs at the United Nations Human Rights Council in Geneva, Switzerland demanding his release, but the reality is that mass support from many different quarters can make a difference. In short, he needs your solidarity.